Kim Campbell, Canada’s only female Prime Minister, spoke at U of T last week to discuss women in leadership and the barriers to entry that they face. The event, on January 18 at the Isabel Bader Theatre, was held by the School of Public Policy and Governance (SPPG) and featured a talk given by Campbell, followed by a panel discussion with prominent women in the field of public policy, including Sarah Kaplan, Professor of Gender & the Economy at Rotman School of Management, and Terhas Ghebretecle, the Director of SPPG’s Gender, Diversity, and Public Policy Initiative. Campbell focused on the problems she saw with how people perceive leaders, and how to fix these issues. She began by talking about whether things have changed since she was chosen for Canada’s top job after then-Prime Minister Brian Mulroney resigned in 1993. Campbell served as Prime Minister for less than a year before her party, the Progressive Conservatives, were elected out of office. “When I had political retirement thrust upon me by the Canadian electorate, it gave me time to go back to my social sciences roots,” she joked. At the conclusion of the marathon federal election campaign of 2015, the change in the direction our government was monumental; namely, Parliament shifted from a Conservative majority to a Liberal one, with the Liberals starting the race with under forty seats in the House of Commons. However, the momentum for women in the House of Commons has been more glacial than staggering: only 88 women were elected on October 19, representing a meager one per cent increase from the 2011 numbers. Having worked on the national campaign for the Conservative Party, I got to witness this dearth firsthand at all levels of political participation. It ranged from candidates looking to get elected, to volunteers helping them along the way. The situation for women in politics is far from ideal. When asked to offer their support, potential female volunteers replied that they would have to ask their husbands before committing to coming into the campaign office. In different circumstances, I encountered female friends who refused to run in order to avoid the intense scrutiny that would be directed at them and their families. When trying to identify the reasons for the lack of female participation in politics, it is easy to default to speculating about a toxic culture that upholds an ‘old boys’ club, or to the lack of strong role models for young women considering candidacy. However, my experience working on the Conservative campaign proved both of these theories to be patently untrue. On the campaign trail, I have received mentorship and encouragement from men and women alike, and am incredibly grateful for the opportunities I have been given. At no point have I felt any semblance of a glass ceiling. Further, I had the chance to hold positions of leadership such as coordinating the national phone banking effort, and felt like my opinions had both value and impact. The important thing is that you take action to correct stereotypical beliefs about women in politics, and embrace the notion of gender parity in Parliament. Gazing upward, I saw incredible female mentorship and leadership, such as Jenni Byrne, the national campaign manager for the party, or candidates and champions like Lisa Raitt, who was running for re-election while balancing a family life. Only decades ago, seeing such strong role models in any party would have been next to impossible. I urge any young woman who is hesitant about any sort of political involvement to recognize that this field has become more favorable to their presence today than virtually any time before in Canadian history. This rosy picture notwithstanding, why has progress for women in politics moved so slowly? The reasons most reflective of the current political situation are the ever-present, and constantly scrutinizing media circuit, and a lack of individualized approaches toward female candidates. The media is often significantly harsher on women than men, focusing on physical appearance and romantic or family life in lieu of professional accomplishments for elected officials. Little attention is given to dealing with issues of childcare and family life, to the grim reality that the life of an elected Member of Parliament involves spending weeks at a time away from home, or to legislation targeted toward improving the life and status of women. What’s more, there is also the issue of not taking an active effort to correct preconceived beliefs that women often hold about politics and public service. The majority of outreach parties focus on prospective voters and donors, rather than correcting a disparity within the candidate pool. A gender-balanced political system that adequately represents the composition of the Canadian population may one day become a reality, but the work to be done along the way is up to all of us to take on. More women in the House of Commons would mean a different and nuanced perspective on the issues currently being discussed, new topics that have previously been left untouched being brought forward, and a system that better represents Canadian concerns overall. We must ensure that the progress that has been achieved up to this point — albeit slowly — continues. This can be achieved by women themselves putting their names forward as candidates for the party of their choice; moreover, on a community level, we must all support and respect the women who choose to do so. 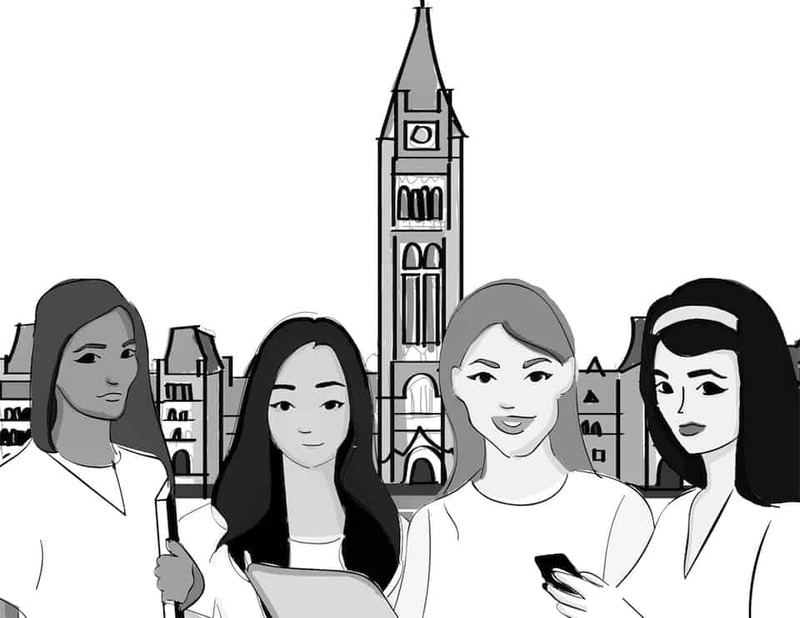 If you are a young woman hoping to get involved in Canadian politics, or to ameliorate the current gender gap, I encourage you to get involved with the U of T Equal Voice Chapter, an organization dedicated to getting more women elected to all levels of Canadian politics through mentorship, support and training. Check us out at http://equalvoice.ca or on Facebook at Equal Voice – University of Toronto. We often host events on campus with Members of Parliament or politically influential women, and frequently cooperate with the partisan campus chapters to create more opportunities for women to get politically involved. Alternatively, you can get involved in the partisan campus political group of your chosen stripe; as a member of the University of Toronto Campus Conservatives, I know firsthand of the great fundraising and advocacy work they do. Above all, the important thing is that you take action to correct stereotypical beliefs about women in politics, and embrace the notion of gender parity in Parliament. Because if not you, then who? Daryna Kutsyna is a third-year student at Trinity College studying international relations and history. She is the co-president of U of T’s Equal Voice Chapter.